Without checking your calendar, can you remember where you were on at 8:30 am April 24, 2015? Some of you might, but more will likely have to think hard to remember. In contrast, if you ask someone who lived in the Pacific Northwest 35 years ago where they were at 8:32 am on May 18, 1980, they will tell you exactly what they were doing without hesitation. Momentous events like the massive explosive eruption of Mount St. Helens in Washington State live in the memory of those who experienced them forever. The volcano and its surrounding landscape were forever changed, as was our understanding of how volcanoes work and the hazards associated with explosive eruptions. The eruption claimed 57 human lives and caused $2.7 billion in damages. It all began in mid-March of 1980 when, within one week, earthquake activity at Mount St. Helens went from nothing to more than 200 earthquakes per day. Volcanologists were called in from Alaska and Hawaii to monitor the situation. Within the first weeks, the scientists discovered that the north flank of the mountain was swelling at a rate of five feet per day. Swelling as magma rises through the crust before eruptions is common and expected, but usually occurs at a rate of less than an inch per day. Mount St. Helens swelled a total of 450 vertical feet in less than two months – an unprecedented and shocking discovery. Officials initiated an exclusion zone and residents within a five-mile radius of the volcano were evacuated. Scientists struggled to understand the restlessness of the volcano while simultaneously juggling relentless requests from the public and officials for an explanation of what was happening and how long it would last. Scientists’ jobs were further complicated by a lack of experience with Cascade-style volcanoes found in western North America; scientists were accustomed to Hawaiian-style eruptions. Also, there was no readily available volcano-focused emergency response plan and limited monitoring capability. Response agencies at all levels were stretched thin, with limited resources. Since this was before the digital revolution, information exchange was challenging and inefficient. After two months of activity and no eruption, pressure from evacuated residents persuaded authorities to permit escorted entrance to Spirit Lake – then a popular mountain tourist destination – for cabin owners to retrieve their belongings. The first escorted entry took place the morning of May 17. 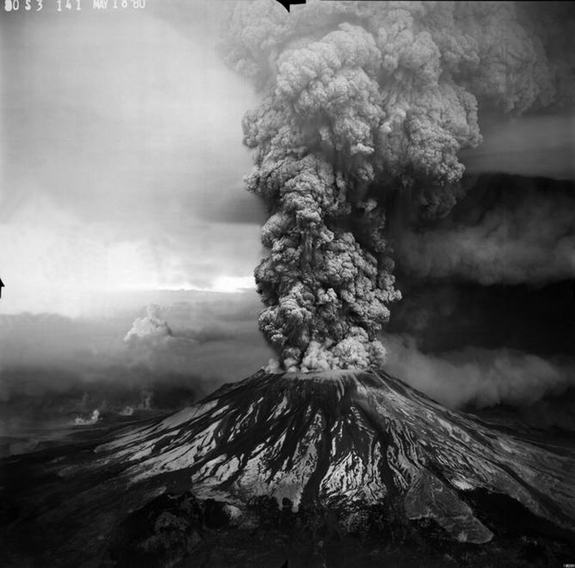 The second escorted entry, planned for the morning of May 18, was thwarted by the unexpected climactic eruption, initiated by the collapse of the northern flank of Mount St Helens. This collapse produced the largest landslide in recorded history which traveled nine miles down the Toutle River. The landslide exposed gas-rich magma that rapidly expanded and triggered a sideways-directed explosion, called a lateral blast, marking the onset of the eruption. The lateral blast generated a searing hot cloud of gas, ash and rock, called a pyroclastic flow, that traveled 11 miles north over rugged topography in less than seven minutes. The pyroclastic flow leveled and scorched trees, and devastated more than 230 square miles of a dense, old growth forest. The explosive eruption continued for nine hours, producing a 13-mile-high eruption column that dumped a constant rain of ash across eastern Washington. The ash traveled and fell as far as Utah, Nebraska and the Dakotas. The eruption and impact were far greater than predicted, as demonstrated by the inadequate five-mile radius exclusion zone. The explosive phase of the eruption finished around 5 pm. Mt. St. Helens continued to erupt intermittently until 1986, although most subsequent eruptions were nonexplosive and produced thick lava that ponded in the crater. The 1980-86 eruption of Mount St. Helens fundamentally changed our understanding of volcanic behavior and the protocol for dealing with volcanic unrest. The episodic increase in unrest before an eruption, such as ground swelling and increased earthquakes, allowed scientists to vastly improve their ability to monitor active volcanoes and forecast eruptions. This new knowledge was successfully applied to the 1991 eruption of Mount Pinatubo in the Philippines, where early evacuations saved tens of thousands of lives. Now scientists recognize the characteristic bumpy landscape caused by volcanic flank failure landslides. They also are aware of the common thin and easy-to-miss deposits indicating previous flank collapse and laterally directed explosions. Most important for current residents in the Pacific Northwest, the Cascade Volcano Observatory was initiated to monitor our many sleeping giants. While eruptions like Mount St. Helens continue to provide insight into the controls on eruptive behavior, there are still many unknowns. By 2004, when Mount St. Helens began to stir again, many of the problems faced during the 1980 eruption, such as monitoring techniques, data transfer and emergency response, were resolved. Yet the uncertainty in the eruption style, size and duration complicated the scientific response. It was impossible to know if remnant, gas-free magma would erupt as lava in the crater, or if there was a new, gas-rich batch of magma on the way to the surface to produce another explosive eruption. These types of scenarios and questions drive the science of volcanology, and keep us returning to volcanoes like Mount St. Helens year after year. The past is the key to the present, and we will continue to unravel mysteries of volcanoes for years to come.